For we Americans, this weekend is for remembering our fallen heroes. A lot of shopping goes on, but hopefully the parades and events honoring all our veterans and those who lost their lives will take center stage. I made this quilt in 2005, using some Americana fabric resembling the stripes of our flag. 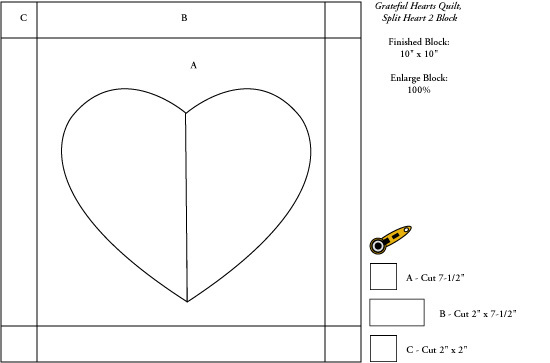 I took a simple heart shape and divided it both vertically and horizontally and cut out appliques. 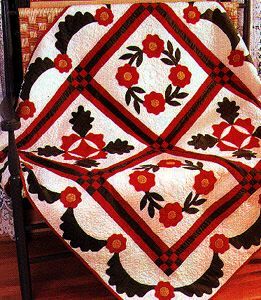 Just another project for me, published in one of our QUILT magazines that year. But then the nephew of our dear friends died in Afghanistan. He was so young and now he was gone. I knew this quilt needed to go to his parents and my husband and I drove to their house in Atlanta where we were able to meet the parents, share some tears, and then I gave them the quilt. I can never forget, and that's why we REMEMBER. 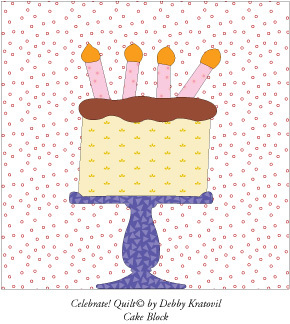 I used this design for my 2010 calendar and I am featuring it here today, FREE, for all to enjoy. You can make it in patriotic colors or any colors! And to my international friends, you can celebrate your own heroes with your country's colors. A simple design with a lot of heart. Click here to download the 7 page pdf of this quilt. 2013 Block a Day Calendar is Coming! 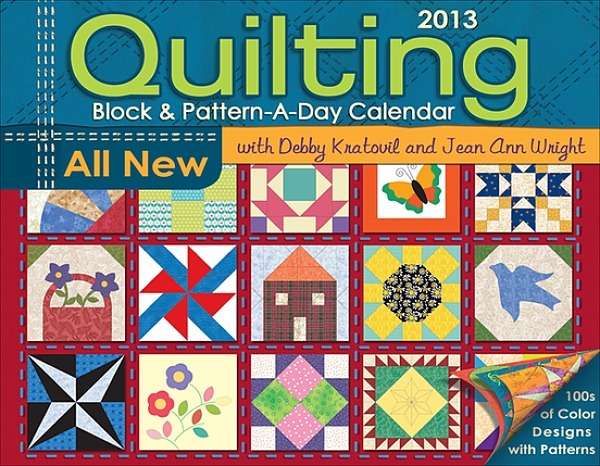 I just received my author's copy of the 2013 Block a Day Calendar and I am impressed! OK, I'm not bragging so much as that I could actually create new designs after all these years (I've created the calendar since 2006). 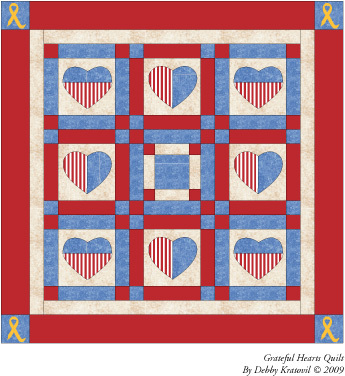 There are 70+ quilts with all the supporting blocks for a total of 320 pages of inspiration. This is more than 5 quilt books would contain. Jean Ann Wright contributed 2 months worth of projects and I couldn't have done it without her! I have to figure out a way to give away a few copies of this on my blog. And I will be uploading a sample pattern with permission from my publisher. But for now, ask your local quilt or crafting shop if they plan on carrying it. There are some awesome patterns in there! Today is May 22 and the block for today is Spring Bud. It is rainy and overcast where I live. 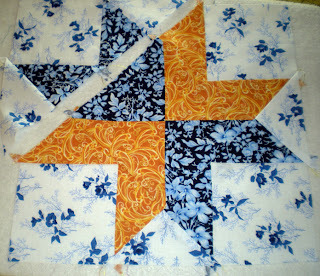 But there are always quilt blocks to cheer me up. 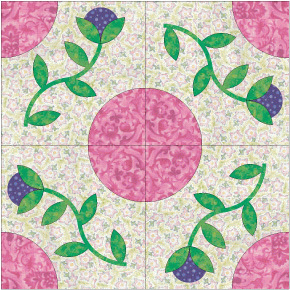 The Spring Bud block is in my perpetual Block a Day calendar (Martingale) and when I designed the companion CD, I took it upon myself to design the block in TWO sizes and also create a bonus image of what 4 blocks look like together. This foursome makes me smile and I feel the urge to sew them today. Hmmm - maybe? 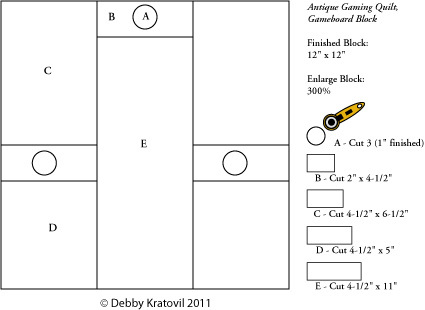 As promised, here is the pattern for the remaining blocks and the basic fabric requirements as they appeared in the "2011 Quilting Block & Pattern a Day Calendar". Very basic, but they get the job done! 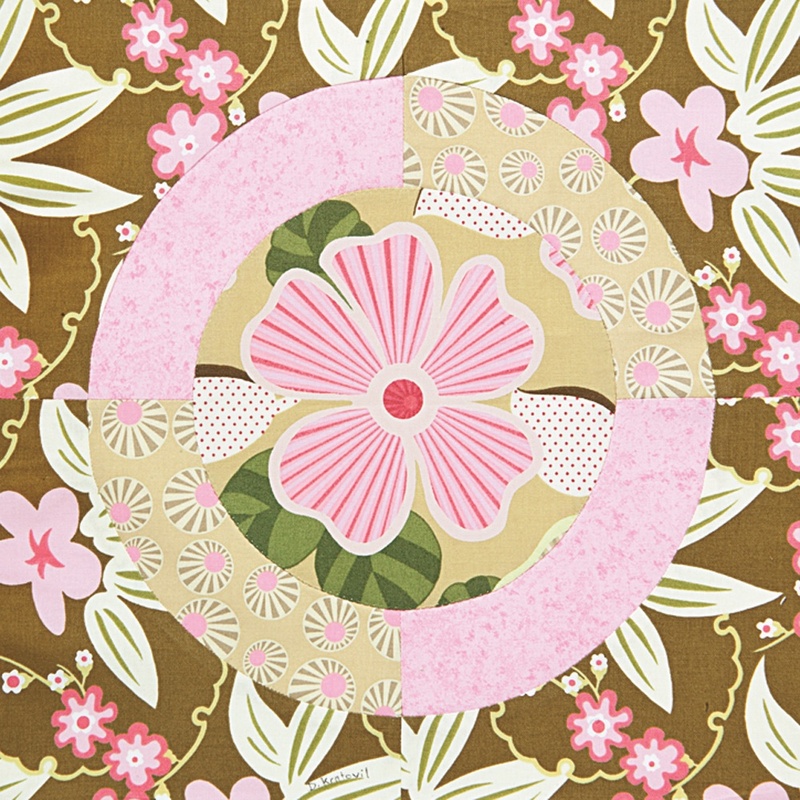 The "B" Templates are teardrops appliquéd on top of the 12-1/2" background. This is a good quilt for that man in your life who doesn't take well to girlie prints (like one of my sons in law). 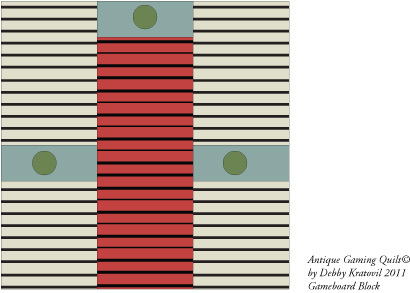 This is a great wall quilt and really is based on an antique game board. 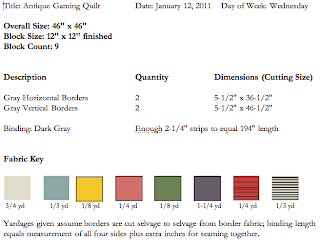 I received an email from a quilter asking about one of the blocks in my Block a Day Calendar by Martingale. 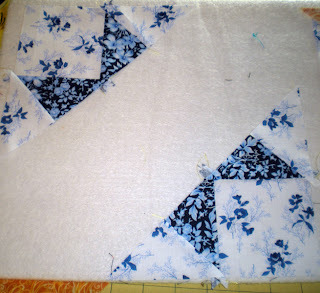 It seems that she and her quilting group were finding that their block points were being lopped off - that perhaps the cutting dimensions were incorrect (and they could be - I'm only human). She referred to several blocks, but I am only going to reference one: The Right Hand of Fellowship. 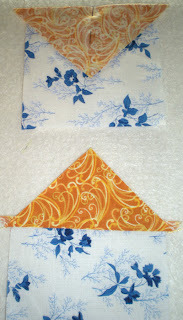 Click here for a one page pdf of HOW to figure these triangles for ANY size! 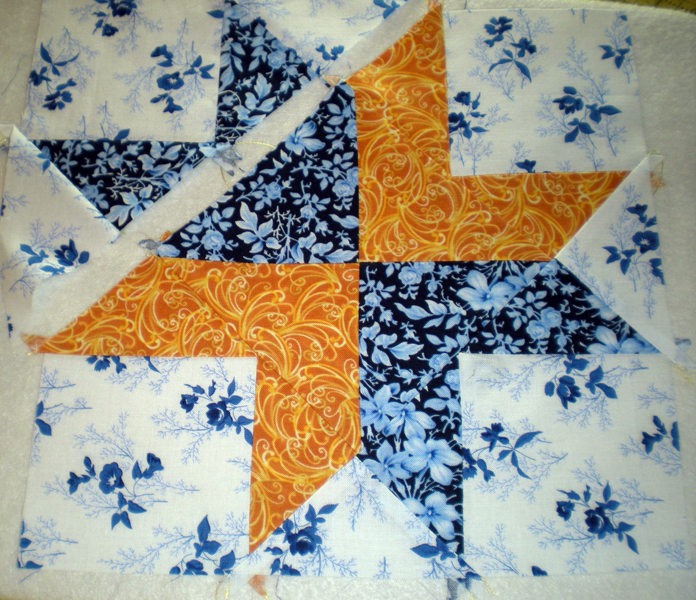 To begin, notice in the picture above that there are 3 unique patches: a small triangle (cut a square into 4 equal triangles), a large triangle (cut a square into 2 equal triangles) and four corner squares. 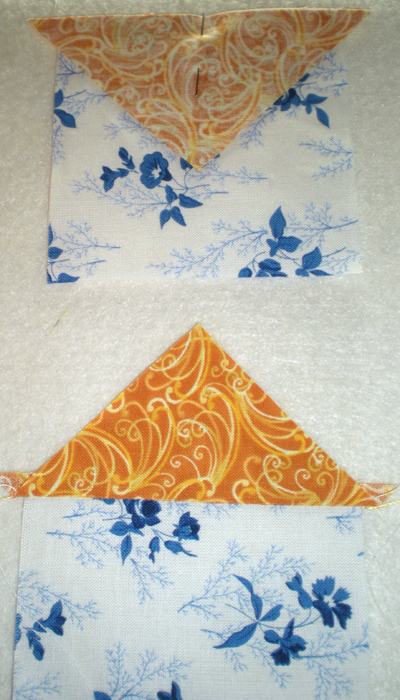 In the pic on the left, notice how the small quarter-square triangles are aligned with the square patch. THIS IS CRUCIAL!! The little corners of the triangle MUST hang over equally on the square's sides. This is in order to accommodate the 1/4" seam allowance. 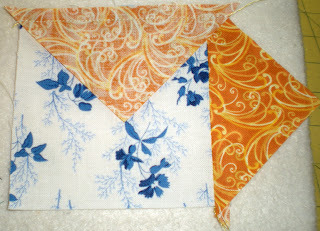 Once sewn, press the triangle AWAY from the square. Triangles hang over sides of square again! 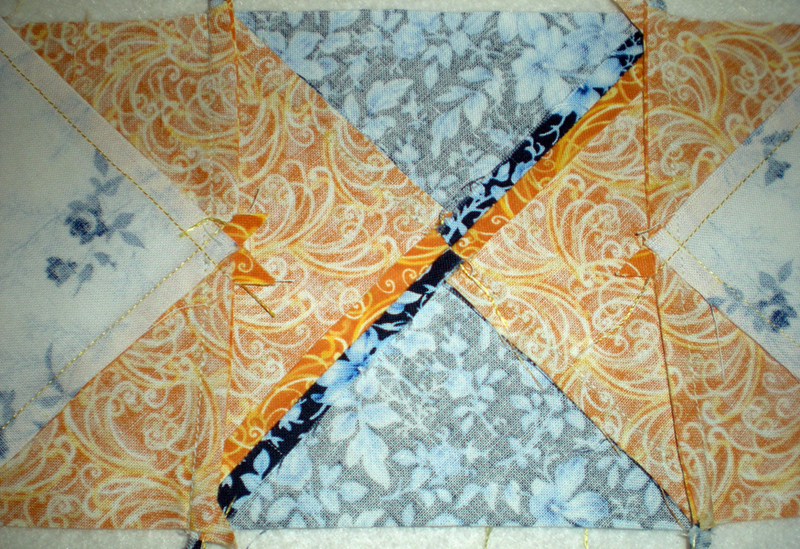 Sew two triangles to the square as shown in the next pic. Press the seam outward as before. Can you see the 1/4" seam allowance at the top of the 3rd picture? This is needed so that when the block is joined into a larger quilt, the point of the square isn't lopped off. 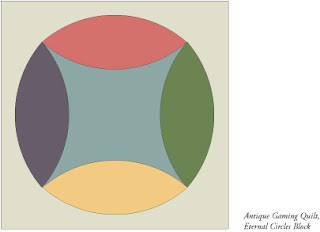 That is the magic of this sort of triangle. What is the formula for quarter square triangles? Finished size PLUS 1-1/4" for seams. 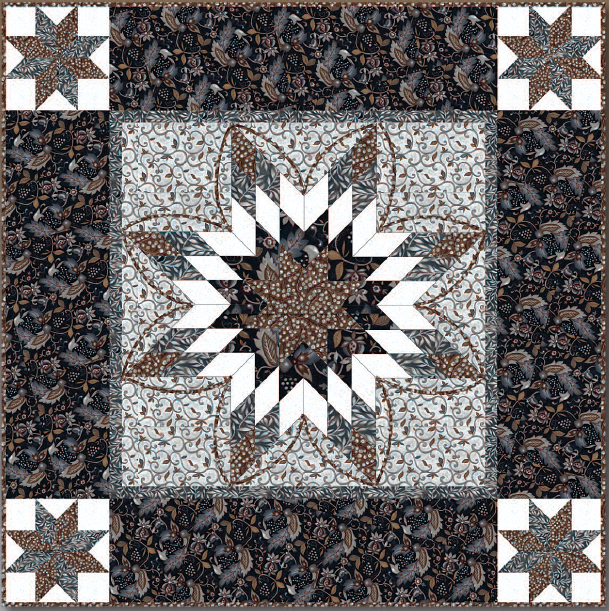 For this 9" block, the finished size that the triangle occupies is 3", so we cut a 4-1/4" square (3" plus 1-1/4") along both diagonals to yield four of these triangles. 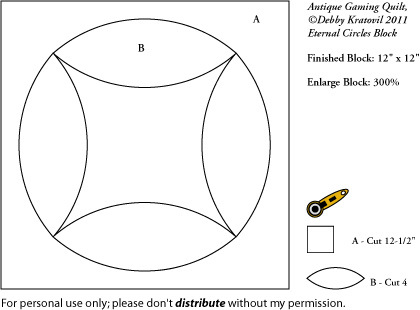 Block parts before joining. Notice the 1/4" seams. Now we get to the larger triangles which were cut from a square also. But these are only cut into two triangles each, so the FORMULA is? Finished size PLUS 7/8". So, the finished size that the triangle occupies is 3". For this we cut 3-7/8" squares. Units are joined. Notice at the block's underside (scroll down) that it's OK if you press seams open. In fact, I do it often in order to reduce bulk. Block is finished but I have yet to trim off the little triangle ears. I leave them on the block until it is finished. I leave them on while I am constructing the block because they aid in patch alignment. Here is a picture of the ENTIRE quilt to get you interested. 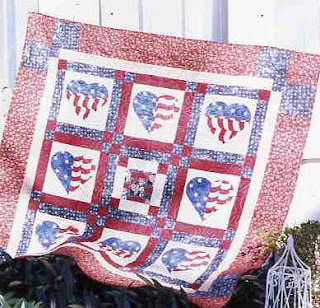 It is a fabulous quilt to make for that man in your life - seems like there are way too many girlie quilts and not enough macho-without-flowers quilts out there. Do something nice for that man, especially in light of Father's Day coming up in June! 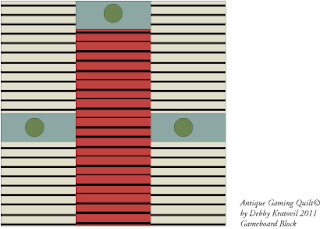 Here is another free pattern I created for Blank Quilting. 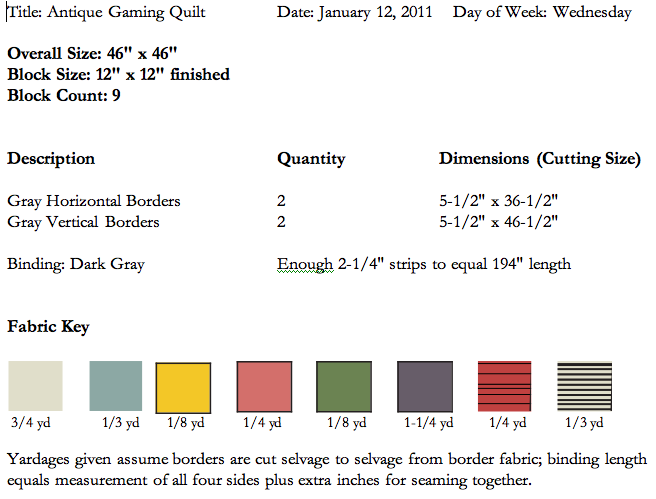 I've made this quilt before and it falls in the category of Supersize 'Em Quilts (like my book). The center star is 35" square. Can't get much bigger in block size than that, huh? You can get the 7 page pdf by clicking on either link. The pattern is in color and has step by step directions for rotary cutting and sewing the units. I have discovered that I now collect yarn and patterns just like I collect fabric for quilting! It's so portable and because of that, it's all over my house. 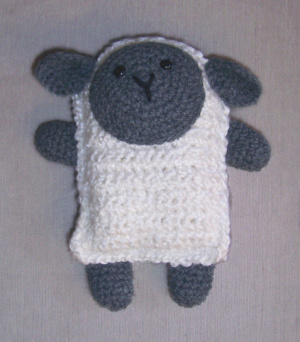 One little pattern I got from the Lion Brand website (I have no financial affiliation with them except that I BUY their stuff) is the Little Lamb. I have yet to finish him (it's a very easy crochet pattern) and maybe I should since my grandson is growing up so fast. 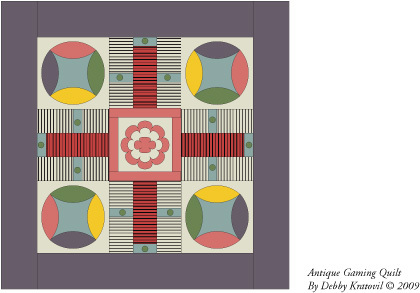 Should I rename my blog to "Debby Kratovil Quilts & Crochets"? And the little lion over on the right, the button for Lion Brand - I got that pattern (free) and bought the yarn. What am I waiting for, huh? Heading to the Baltimore Heritage Quilters Guild tonight and I've decided to take some quilts that never go on the road. The one that has been crying and making such a fuss is this Oak Leaf and Rose Wreath that I made at least 10 years, if not 15 years, ago. Sigh! Such prima donas! I began making this quilt thinking I would sew it by hand. Where's the trash can? I tossed that first block inside and whipped out my fusible webbing and sewing machine and calmed down. I don't have a pattern for this, but I think I used the blocks in a previous calendar. I'll search for them and then post it when I find it. For now, just look at this quilt! What came first? The Cake Quilt or the Cake Block? Actually, it was the quilt. 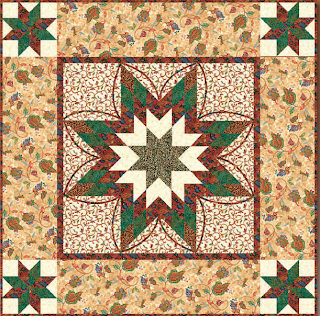 It appeared in Quilt Magazine several years ago. 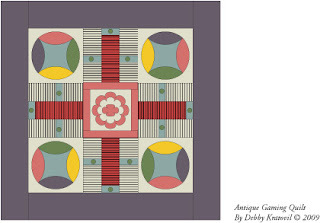 My editor, Jean Ann Wright, loved it and we presented the pattern for making it with full size templates. 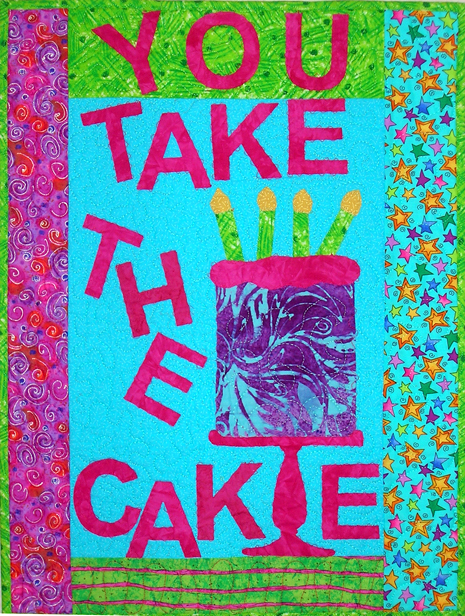 While this real quilt appears to have a taller cake (more layers, more icing - YES! ), you can improvise using the templates I provide in the posting below. 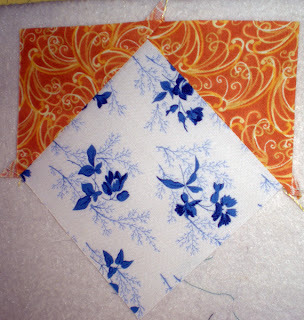 Many thanks to Sew We Quilt for linking to my very new and modest blog. Well, it's time to get some more free stuff out there. I am the Queen of Free - patterns, that is. This block is mirrored at the Sew We Quilt web site and I understand it is a very busy and awesome site. 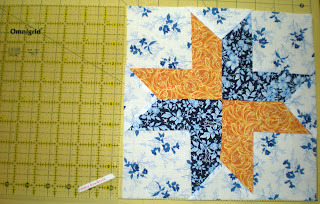 Today, Monday, May 7, one of the blocks from my 2011 Block a Day calendar will be posted there. For those who aren't familiar with these calendars, they are published by Andrews McMeel and I have been creating them since 2006. I currently am finishing up the 2014 calendar (what? aren't we still in 2012?) The blog chosen by the moderator on Sew We Quilt is my "Celebrate" block. It's easy to appliqué and is fantastic to make and have on hand for ALL celebrations! 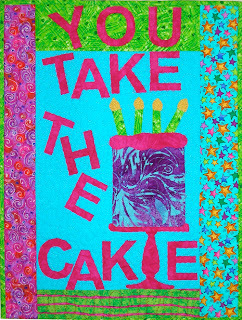 Cake is where it's at. In fact, the title of my imaginary autobiography is "Is There Any Cake in the House?!?" 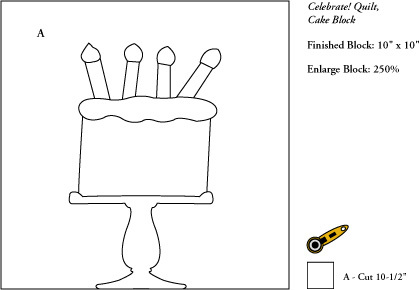 I love cake and I know you'll love this block. Here are the directions for making the block (see below) and also the FULL SIZE TEMPLATES in a downloadable pdf. Muchas gracias para les visitan mi website! 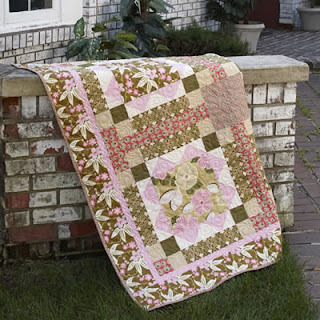 This first quilt appeared in the Spring 2011 issue of Easy Quilts by Love of Quilting (Fons & Porter). A wonderful way to capture the beauty of a large scale print. It is 53" x 53" and if you missed the issue, you can get it from their shop. 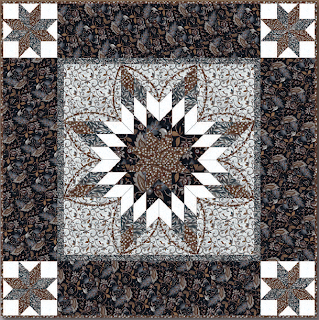 They also offer the digital pattern at their shopping site. Since I'm not paid for that pattern reprint, I'm not going to give the link. Fabrics generously provided by Benartex Fabrics - love, love, love those fabrics! Hey, guess what? I found all the directions and art that I had created when I sewed this quilt. You can have the pattern for the above quilt FREE - yes, I said FREE. Just click this link: Arianna's Garden, and it will take you to the 4 page pdf, in color, from my web site. These are NOT the same instructions given in the magazine. They write up all their own. 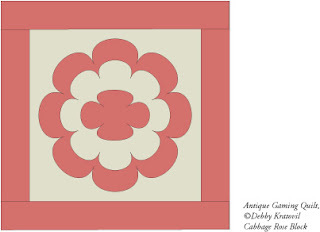 This next quilt I made using my Quiltmaker's 100 Blocks entry. 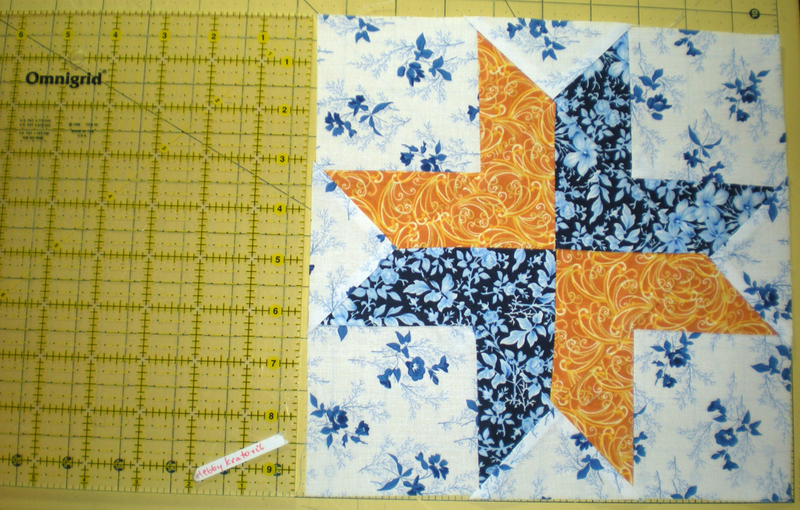 Only 5 blocks because I ran out of fabric. 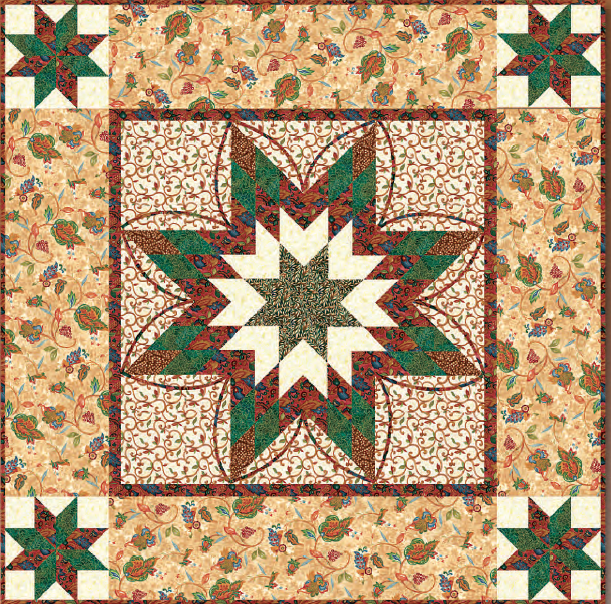 This is a fabulous quilt but didn't make the cut for a future Quiltmaker issue of quilts made with these blocks, so I will just have to teach classes using it! I love it because it is a non-traditional setting. 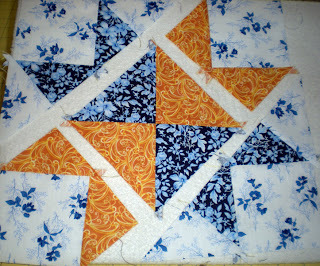 Of course, I was aiming for 6 blocks and just plain ran out of fabric! Creativity to the rescue! 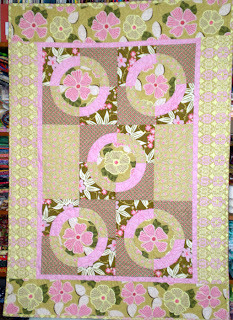 Quilted by the famous Connie Gallant, my faithful friend and awesome longarm quilter. Yikes! 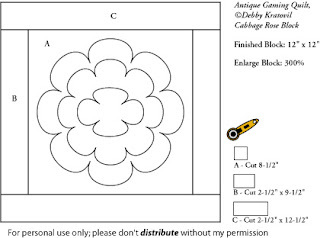 I forgot to add the picture of my block, Flower Burst. The fabrics are from the Arianna Collection by Benartex www.benartex.com. 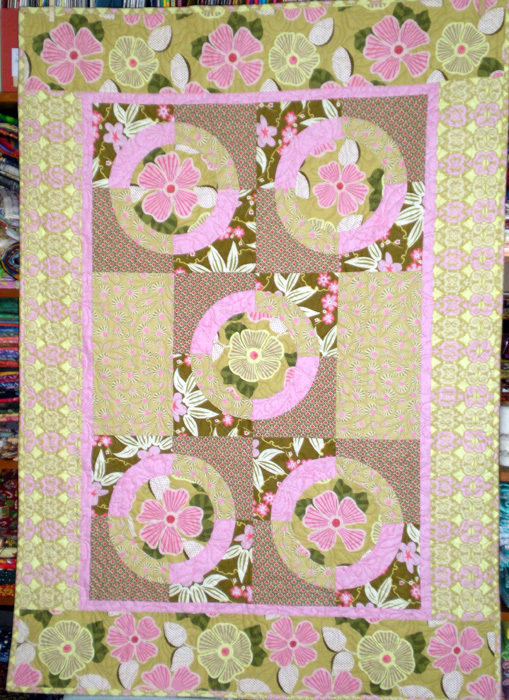 I made a larger quilt with those fabrics which appeared in the Fons & Porter Love of Quilting Magazine last year. The fabrics were so yummy and sweet that I am still sewing with them. Don't be afraid of those curves - they are gentle and the center flower is possible to fussy cut and then applique over top of that giant hole. I used invisible thread and even close up, it's nearly impossible to see the tiny zig zag stitches. 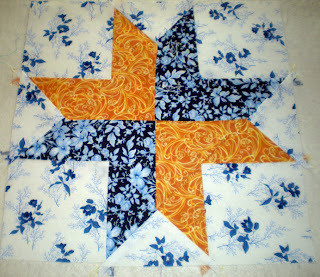 Quiltmaker 100 Blocks - Again!